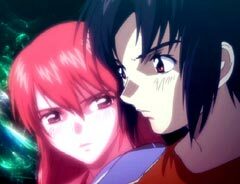 Join Animefringe as we reaching for life in the uncertain anime world of Fafner. For most students in the US, summer is coming to an end. Labor Day weekend offers many kids their first day off in the new school year, but it's a bittersweet experience, as it tends to also be nestled among the first few weeks that they have to return to class. Yet the return to school is a relatively benign experience compared to other signs of getting older. From the moment that you realize that it's time to get a job, to the death of a close friend or relative, it doesn't take long for people to realize that life is short. In times of war, the awareness of our own mortality is especially keen. Even if we don't personally know the soldiers dying in Iraq -- on either side of the battle -- the pain that their families must feel resonates with many of us. Perhaps that's why so many stories deal with the end of the world. One way or another, this world will eventually end for each one of us. It's something that every human is destined to experience; in fact, it's the only guaranteed experience for every living creature. For whatever reason, Japanese people seem particularly aware of the fleetingness of life. There is no shortage of cultural metaphors for change and for death in their culture. Even the lovely Sakura Blossom Festival is a nod to the fact that living things cannot last forever. Those in the land of the rising sun do not necessarily fear death. They simply acknowledge its inevitability as a force of nature. 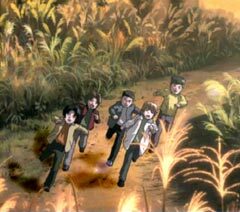 This theme is exceedingly prevalent in anime, partially because of the Japanese people's historically ingrained feelings about transience on this planet, the lasting psychological effects of the atomic bombings of Hiroshima and Nagasaki, and because it's something that every human being can relate to. Change. Loss. Destruction. The end of everything. You have to admit; it's pretty darn marketable. 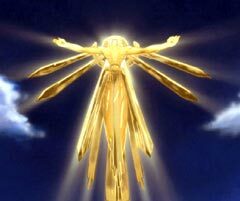 If this kind of tale wasn't, you can be certain that a series such as RahXephon would never have been made. Yet the reason why stories like Neon Genesis Evangelion or Saikano have such lasting popularity is because they strike a primordial nerve in the human psyche. Even Osamu Tezuka, the father of manga himself gave the subject serious attention with his career's most far-reaching collection of works, the Hi no Tori (Phoenix) saga. Of course, the true reason that such series connect to their viewers so well is because they almost always offer the conciliatory notion that with every death, there is rebirth. For every loss, something new is found. So long as hope exists, life will never be fully extinguished. Kazuki Makabe was content, living with his father on Tatsumiya Island. Taking up the tasks that would've been performed by his mother if he had one, Kazuki dutifully, if somewhat begrudgingly, handles the household chores that keep him and his dad fed and their clothing clean. When we first meet him, he's a typical student. He has a slightly unusual history with his best friend, Soshi Minashiro, but aside from one odd incident in the boys' past, he feels the same about school and housework as any other average kid. Life on the idyllic island, however, was not meant to go on in the same way forever. For Kazuki and his friends, this realization came quickly and painfully, delivered by the hands of a telepathic alien. The truth is revealed quickly. First of all, Tatsumiya Island is not a natural island, but a fabrication constructed by the older inhabitants to protect a small subset of the human race. It is believed that most other people on the planet did not survive the arrival of the Festum, although rumors persist that other pocket communities exist. Not much is known about the Festum, except that they're intent on absorbing every human being on Earth into themselves. They can read human minds, an ability that rendered conventional weaponry completely worthless against the gigantic biomechanical creatures. They only ask one question: "Are you there?" If a person is foolish enough to answer this fundamental existential query, he or she merely alerts the Festum to the person's presence. A Festum's awareness of a person is tantamount to a promise of a quick death. Kazuki is offered a choice when the creature discovers his island. Either he can embrace the void offered by the Festum, or he can fight. He discovers that most of the inhabitants of the island were preparing for the threat of an alien attack. 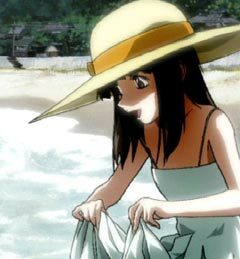 Even better, he finds out that they have developed a countermeasure, dubbed Fafner. Naturally, this defensive weapon is in the form of a giant robot -- one that Kazuki is particularly well-suited to piloting, although he never knew of it prior to the attack. Surprisingly, Soshi not only was aware of Fafner, but he's the key component in the Siegfried System -- the control network for Kazuki's mech. Soshi serves as an extra set of eyes and ears for Kazuki, and he issues commands for Kazuki to follow. Somehow, Kazuki is able to thwart the advances of the Festum with the aid of Soshi, but many lives are lost in the battle. Now that the illusion of peace has been shattered, other children are drafted into the Arcadian Project as pilots of other extensions of the Siegfried System. 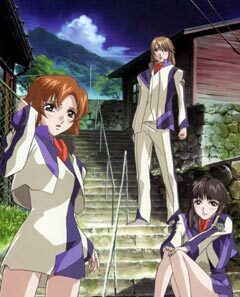 Kazuki's classmates Maya Tomi and Shoko Hazama are among those chosen to defend Tatsumiya Island. Maya is a close friend of Kazuki, and while she's a bit of a tomboy, she seems to have a little crush on him. Shoko doesn't make it to class frequently because she's often ill, but Maya has always taken care of her. 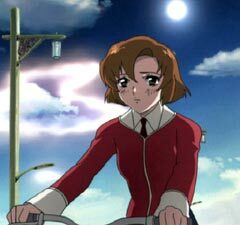 Shoko's parents are informed that her physical frailty has no bearing on her ability to pilot one of the Fafner mechs, thus she's recruited for the team. 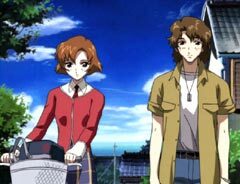 While monumental conspiracies and high technology are a pivotal aspect of Fafner, more than anything else, the show promises to be concerned with the development of its protagonists. This is as much of a psychological drama as it is a laser-blasting sci-fi epic, although that's pretty much a requirement established by the show's numerous stylistic predecessors. Fans of opera might have already noticed the numerous allusions to the work of Richard Wagner, but even if you're familiar with his classic stories, this adaptation is far removed from the original writings. That's not exactly something to bemoan. This wouldn't be the first time Der Ring des Nibelungen (The Nibelung's Ring) has been rewritten -- there is even a graphic novel version of the classic fantasy. It is also quite appropriate for a tale filled with such a vast amount of symbolism to be adapted and told in another language, and to be applied to a completely different world than Wagner's Europe. It's important to remember that there is far more to Wagner's story than merely its setting. Life and death, change and rebirth, hope and fear -- these are the themes established more than a hundred years ago by Wagner, and they are just as applicable today as they were in his time. Swap out the orchestra with the sounds of anti-aircraft missiles, and you have essentially the same story. Besides, it's only appropriate for Wagner's story to evolve over the years. If there's one thing that's certain, it is the fact that life does not stand still. It is fluid. The question posed in Fafner, the question that echoes in each of our souls if we listen carefully enough, is what do we really want to do about the fluidity of life?